This year, three huge mobilizations of opposition supporters have shown the government in peaceful protests. 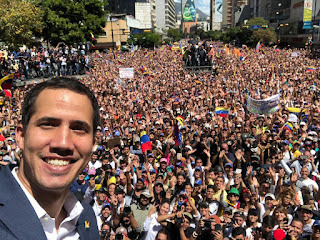 Protests are due to the two men who claim to be Venezuela's legitimate president, Maduro and opposition leader Juan Guaido. 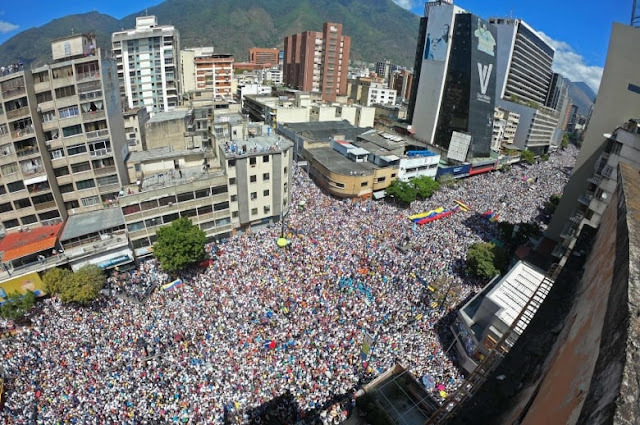 Greater police presence did not deter Venezuelans from pouring into the streets again Tuesday to protest the Maduro government. Juan Guaido has declared himself President and asked for foreign aid. Maduro has tried to block necessary humanitarian aid from the US which would help Venezuela's over 200,000 sick and needy people. Despite the difficulty and the fact that we are going through the deepest crisis, we do not give up. We are and will continue on the street! I took this picture today, to show the world the faces of hope and to believe in ourselves again. Anti-government Venezuelans turned out in the thousands despite Maduro's tactics. Anti-Maduro protesters fill the streets of Caracas, chanting anti-government slogans. The presence of gangs known as colectivos, armed by the government Socialist Party, often attack opposition demonstrators from motorcycles. They have been responsible for many of the fatal shootings at past demonstrations.